“Grits & cornmeal are here!” said the hand-lettered sign. That’d be worth checking out anywhere. But this was inside the front door at Mary Jo’s Cloth Store. If you don’t sew, or aren’t married to someone who does, you might not have visited Mary Jo’s in Gastonia. It’d be on the list of the Seven Wonders of North Carolina, should someone ever make such a list. 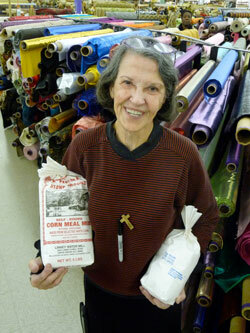 Mary Jo Cloninger started a little cloth emporium behind her daddy’s barbershop in 1951. One thing led to another, and today she presides over a sprawling former discount store filled to bursting with bolts of every kind of fabric. Seems that Billy Linney, who runs Linney Water Mill in Union Grove, North Carolina, brought some fresh-ground samples over to Mary Jo several years back. Linney’s is one of the last mills in North Carolina still powered by an old-fashioned water wheel. Cloth-buying customers snapped up the samples. They loved the memories that those simple paper bags, tied off with string, brought back. So Mary Jo made cornmeal and grits part of her regular inventory. “He can’t make much with that old mill,” cautions Mary Jo. “We usually run out before June.” Then there’s no more until corn harvest time again next fall.